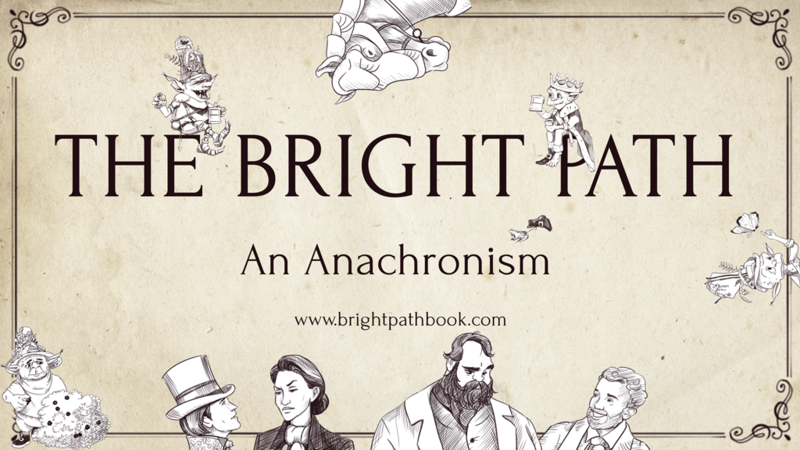 Pre-order The Bright Path: An Anachronism! Every now and then people ask me: “What is The Bright Path about?” Authors are supposed to have a snappy answer to this question, so here it is: The Bright Path is about a colorful group of people searching for new scientific and historical knowledge in a rapidly changing environment while also navigating their own strained relationships with each other. Thematically, it’s about how thought, language, and perception are the real magic in the world. And it comes with a spicy side dish of quantum storytelling! I have loved writing this book, and I hope you will enjoy reading it too. Johnathan Miller, son of George Miller, grandson of Walter Miller, did not want to be a miller. He came from a long and respectable line of Millers, all of whom were millers, and he simply did not want to be one. Millers, to Jonathan, were the sort of people who concerned themselves endlessly with the minutiae of maintaining gear wheels and millstones, worried about the consistency of flour, and generally were satisfied if they ended the day with the same number of hands as when they started. The most satisfying thing that happened to a miller was when a barrel of threshed wheat went in one end and a sack of flour came out the other. Any day in which there is excitement at a grist mill is not a good day, because it means that something has gone terribly wrong—and that generally means a deficit in the closing balance of body parts. Jonathan did not generally object to being a Miller, except to the very considerable extent it meant he had to be a miller. The old man had given his son a sad, knowing look, and shaken his head. Naturally the boy would have distractions, with all those books his mother gave him to read. George, being an independent businessman, was well acquainted with the advantages of reading, but deep down he thought that the only books really worth the effort were the sort that advertised mill parts for delivery or listed the current prices of flour in cities to the south. But that was not the sort of book that his wife thought fit for her youngest. Old Walter had come to Hog Hurst with the very first settlers twenty-four years ago, moving his wife and two sons from Green Bridge to the new settlement. He’d set about building the first combined grist and lumber mill on this stretch of the Green River, much closer to the endless forests beyond the frontier than the mills in the city. Lumber from that old mill had gone to build a fine village at Hog Hurst, and the surplus went on to traders from down south to be bought, sold, bought, sold, bought, sold, until eventually, Jonathan imagined, it all ended up as fancy tables and chairs in the homes of wealthy people who had potted plants and indoor outhouses. Flour from the grist mill more than satisfied the baking needs of the town, and the surplus was sold on to the caravanners who frequented Hog Hurst’s trading square. By the time Old Walter passed five years ago (in his sleep, remarkably), his son George had already begun training his own three sons in what everyone assumed would become the Family Business. Henry and Mickey, the two older boys, gave every indication of being perfectly content to occupy their waking hours creating hundreds of wooden boards to nearly identical dimensions and hundreds of equally interchangeable sacks of flour, six days a week, for the rest of their lives. Jonathan was not. He knew it, and George knew it. The trouble was that Jonathan, like so many young men of twenty-three years, did not exactly know what he did want, and wasn’t exactly much good at doing anything even if he’d known he wanted to. Oh, the raw material was there. He’d grown into a handsome lad with a tall frame, hair the color of late August wheat, firm hands, a strong jaw, and an easy smile. He could speak with a confident ease to the traders who came into town, and the folk of Hog Hurst treated him with respect—though Jonathan always suspected that had more to do with his last name than with himself. He could imagine all kinds of wonderful careers in the world, most of which involved at some stage or another swinging on a chandelier while waving a rapier and possibly carrying a beautiful woman. It was just that the specifics always seemed to elude him. How did one get to the part of the story just before the chandelier? It was a frustrating mystery. Jonathan did have a specific beautiful woman in mind, however. Her name was Merrily, and today, five days before the Midsummer’s Ball, Jonathan was determined to take the first step toward his chandelier by asking her to accompany him to the dance. “Merrily,” he began. It went rather downhill from there. Merrily was twenty-two and beautiful. Pre-industrial human societies rarely produce beautiful people, even by their own standards; that is why these societies invent beer. But Merrily was the genuine article, by some combination of lucky breeding and divine intervention. She had chestnut hair down to her shoulders, a lithe frame, and a smile that could stop conversation from across a crowded banquet hall. A fortunate abundance of older brothers and sisters had left Merrily to grow up as something of an afterthought, and consequently she had time to develop a love of reading, particularly history and language. (Alice Miller, who insisted on using some of her husband’s considerable income to maintain a tiny lending library in Hog Hurst, was particularly fond of young Merrily, and did her best to cater to the girl’s unusual interests.) Merrily earned her keep in the family by hunting with her older brothers, and by seventeen she could draw a bow as tightly strung as any of the boys’ bows, as well as hit a buck at a hundred paces. She had a pleasing singing voice—a shocking, pure soprano that had never even heard rumor of a thing called vibrato—and enjoyed singing songs that no one had ever heard of before. Jonathan and Merrily were friends, which made it far more difficult. From a young age they had swapped books and stories at his mother’s tiny one-room library, just off the little village’s main street, across the trading square from the equally tiny civic building. When they grew old enough to be out from underfoot in their respective houses, they ran together beyond the narrow band of open fields around Hog Hurst and through the richly overgrown forests beyond, playing pirates and knights and dragons and building immensely detailed civilizations out of sticks. (This, it turns out, is a natural instinct of children everywhere, and more than a few grownups as well.) There was, in fact, still a rope swing out into a small side channel of the Green River where they had swung for hours as children, pretending to be pirates attacking the Carolese Royal Navy or wild ape-men of the Darkest Jungle going on the hunt. There were other secrets too—places and animals and people of the forest that only Jonathan and Merrily knew. They had twenty-two years of history, and right now all of it was piled up in front of Jonathan like a sheer cliff face coated in butter. Jonathan had known for ten years that Merrily was more beautiful than any woman, anywhere, and yet somehow it always came as a shock. Most times he could just ignore the aching in his heart, but his current task made it unavoidable. He groped desperately for words. “Not a bit. If I’m to believe Franco, the Ecclesia got so annoyed with Bel-Khendo they had him assassinated and replaced with an Archbishop who looked very much like him. Everyone was so relieved they just went on pretending it was still Bel-Khendo.” She sniffed. Lately Merrily had been on a rip over political history. Jonathan preferred chandeliers and rapiers, or at least a good dragon or two, but he did his best to keep up. Desperate not to lose his momentum—it had taken him several weeks to work up the courage to have this conversation—Jonathan doggedly took another run at the fortifications of his own insecurities. She looked up at him from the pages. Jonathan didn’t know what this look meant. He was familiar with a great many of Merrily’s looks, from You idiot to You took my stick, prepare to die to What you just said is rubbish and I will explain why, all the way to a sort of a cautious You didn’t affirmatively screw that up, but don’t push it. But he did not know this new look. He panicked. “Who is that?” She had interrupted him, shifting out of the mystery look and into the more familiar I’m surprised and interested in something, so shut up and follow me. Jonathan, partly relieved and partly disappointed, turned to follow her gaze out the door of the library. An unfamiliar man was in the trading square, on a horse. This was not, itself, remarkable. Hog Hurst saw a steady stream of visiting traders throughout the year, who invariably had heavily armed mercenary guards with them. In the summer, too, itinerant workers made their way into town from far to the south, looking for seasonal work. But this man was different. The horse was a particularly large, spirited looking beast, a deep black color with a proud, strong neck and shoulders, and a look that said it might possibly be carnivorous. The man on its back seemed strangely out of place as he swung his legs down to the ground. He wore travel-stained leathers and a wide brimmed hat, a battered breastplate and greaves, and a week’s growth of scruffy, salt and pepper beard. The horse’s saddlebags were unusually large, and bulged with mysteries. A large cart towed by an obstreperous looking mule had stopped just behind the horse and was attached by a lead line, lashed to the horn of the horse’s saddle. The man carried a broadsword, peace-bound and slung across his back. His eyes, as he got closer to the door, seemed to carry the weight of years of… something. It might have been travel, or war, or prison, or years, but whatever that weight was, there was plenty of it. Posted on October 16, 2018 October 16, 2018 Categories Bright NewsLeave a comment on Pre-order The Bright Path: An Anachronism!